THE DOVER DEMON-The Dover Demon was seen three times during the week of April, 1977, creeping about in Dover, Massachusetts, and cryptozoologists are still wondering just what kind of strange being this could be. Cryptozoologist Loren Coleman first broke the case, and interviewed the teenage eyewitnesses who had encountered. At first, they thought they were looking at a dog or cat, but soon became aware that they were seeing an unearthly creature creeping along a stone wall on Farm Street. It has a large watermelon type head with orange eyes, and had skin that looked like sandpaper. Later on that night it was seen again by another eyewitness, again, a teenager. The thing was seen repeatedly by other people during the next several days. One eyewitness estimated it to be about the size of a goat. 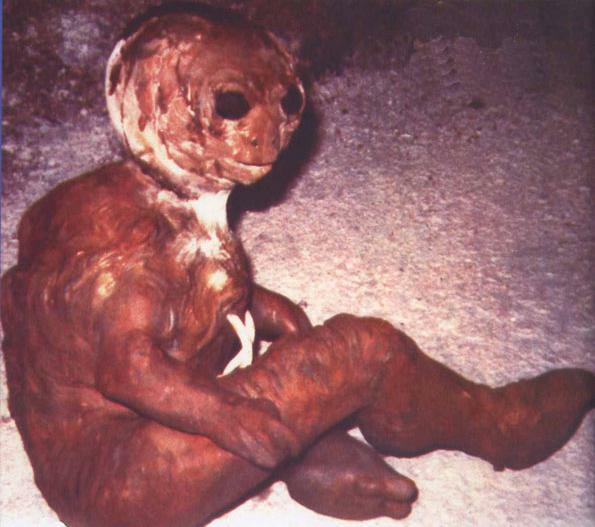 Various researchers have thought this creature to possibly be extraterrestrial in origin, or possibly the result of a top secret government experiment gone wrong, some kind of escapee from a real-life Island of Dr. Moreau . DESCRIPTION: A nasty looking devil-eared freak. MOST RECENT SIGHTING: None have recently been reported, but how many of us would want to encounter this thing slithering along the sidewalk at 1a.m. in the morning in the cold, deep dark of night?